Once in a treatment program, even those who are not motivated to change at first can eventually become engaged in a continuing treatment process. More information can be found in the Principles of Drug Abuse Treatment for Criminal Justice Populations: A Research-Based Guide. In support of those who work with juveniles and adults within the court system, including judges, counselors, social workers, case workers, and others, NIDA has created materials and identified other helpful resources that can be used in educating offenders about the science related to drug use, misuse, and addiction. 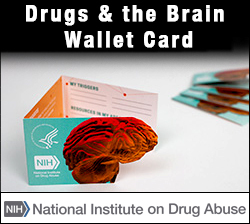 Drugs & the Brain Wallet Card: This tool is designed for people leaving criminal justice facilities and transitioning back to a less structured environment. To prepare these people to return to their home environment, counselors can customize this tool to help identify triggers that could prompt a drug relapse. It also includes information about resources and helplines. These discreet cards can be kept in a wallet, pocket, purse, or cell phone case for easy access. 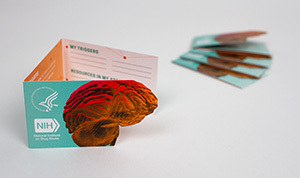 The wallet cards can be ordered free of charge from the NIDA Research Dissemination Center. The Science of Drug Use - Discussion Points: This resource is intended to give judges, and others who talk with offenders, language they can use to explain the risks of drug use, as well as resources that can aid in treatment. The document can be used as a guide when offering someone the wallet card when he or she is leaving the criminal justice facility. Easy-to-Read DrugFacts: These resources provide information about common drugs of abuse; the science of addiction; effects of drug use, treatment, and recovery; and prevention. They are intended for low-literacy audiences and are formatted for easy printing and distribution. The NIDA Research Dissemination Center offers several print publications and posters that can be ordered free of charge and may be useful for this audience. NIDA Justice System Research Initiatives: This page provides information about and links to NIDA’s major research initiatives addressing drug use in the context of the justice system. The following materials were developed using NIDA funding or by trusted partners. This sole-survivor board game provides substance use treatment counselors with an innovative way to motivate clients and open up discussions about the consequences of addiction on themselves and their families. The game format resembles the well-known MonopolyTM game and is available in adult and teen versions. This directory contains resources from the most notable, national sources. It provides information on the signs of addiction, how to prevent drug or alcohol use, drug intervention resources, and finding addiction treatment or addiction recovery and support. NIDA. "Criminal Justice." National Institute on Drug Abuse, 27 Apr. 2014, https://www.drugabuse.gov/related-topics/criminal-justice. NIDA. Criminal Justice. National Institute on Drug Abuse website. https://www.drugabuse.gov/related-topics/criminal-justice. April 27, 2014.